Following the release of the XX1 and X01 Eagle groupsets two years ago, then GX Eagle last year, the latest NX Eagle groupset slots into the lineup as the fourth, and cheapest 1×12 drivetrain option to come from SRAM. Equipped with the same 12-speed technologies as its relatives, NX Eagle is designed to bring the wide-range 1×12 drivetrain down to an even more accessible level. SRAM will be selling the NX Eagle drivetrain for £365 (without BB), which puts it £100 cheaper than a GX Eagle drivetrain, and nearly a quarter of the price of an XX1 Eagle drivetrain. So how has SRAM got the price down? 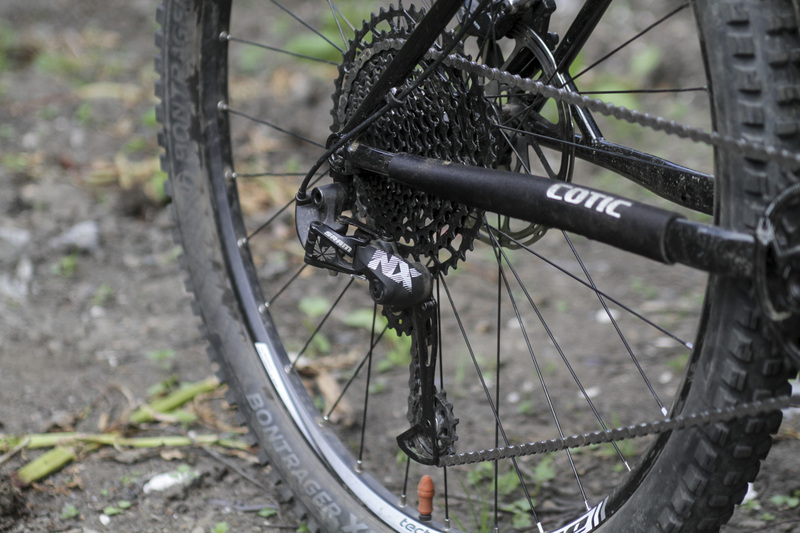 The NX Eagle 1×12 drivetrain strapped on to our Cotic SolarisMAX test bike. All photos shot by the delightful Mr James Love. NX Eagle is still 12-speed, and all of its components are designed to be cross-compatible with existing Eagle drivetrains. Functionality remains very similar, and in some cases identical, to the GX Eagle groupset, but a significant reduction in cost has been achieved by way of a simpler, and heavier cassette. Just like the NX 11-speed cassette, the NX Eagle 12-speed PG-1230 cassette uses a splined pattern to fit on a standard Shimano-style freehub body. 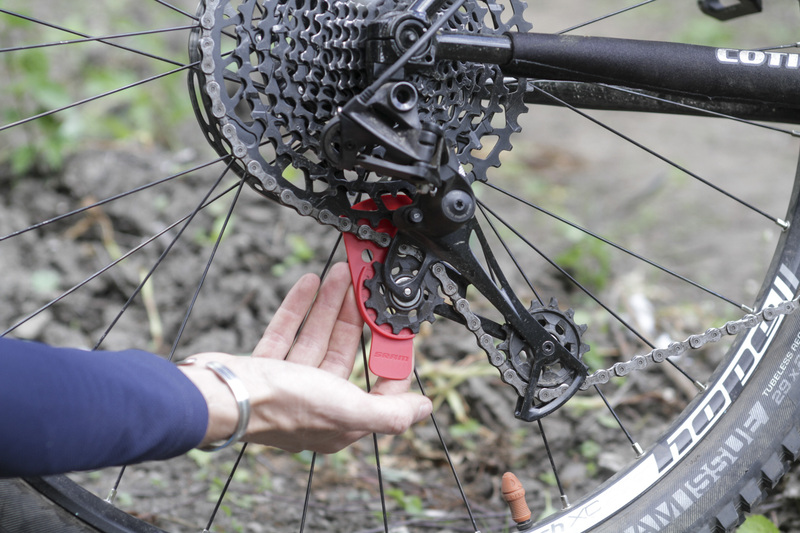 That means SRAM has had to ditch the 10T small cog, which is too small in diameter to fit on a standard (i.e. Shimano-compatible) freehub body. 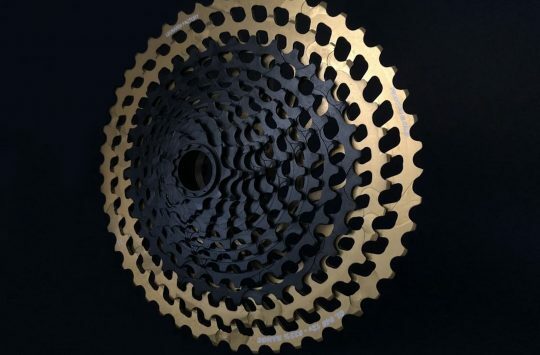 As such, the NX Eagle cassette gets an 11-50T ratio, which produces a 454% gear range – a little short of the 500% range on SRAM’s pricier cassettes. However, it is A LOT cheaper, coming in at £99. In comparison, a GX Eagle cassette cassette sells for £170, and the XX1 Eagle cassette alone has a list price of £408. To find out whether the performance matches the lower price point, I’ve been riding an NX Eagle groupset for the past month. Along with a fresh gear cable, the drivetrain has been set up on a Cotic SolarisMAX steel trail hardtail, which uses fully external cable routing. Without any articulating suspension to potentially cause ghost-shifting, this would prove to be an ideal platform for testing out the shift quality of the NX gears. Because of various work trips and bike launch commitments, I haven’t been riding the bike flat-out in that time. I’ve still managed to put a couple of hundred kms on it, which has been enough time for everything to bed in and give me the chance to get a thorough impression of how it all works and feels. I’ve been testing the NX Eagle groupset for the past month. In a miraculous turn of events for Calderdale, we’ve been blessed with uncharacteristically dry and warm weather over the past few weeks, so I can’t really comment on the NX Eagle groupset’s performance in mud as of yet, nor can I make any sweeping conclusions about its longterm durability. We will be delivering a longterm durability report in a few months time, but until then, here’s how everything has been going so far. 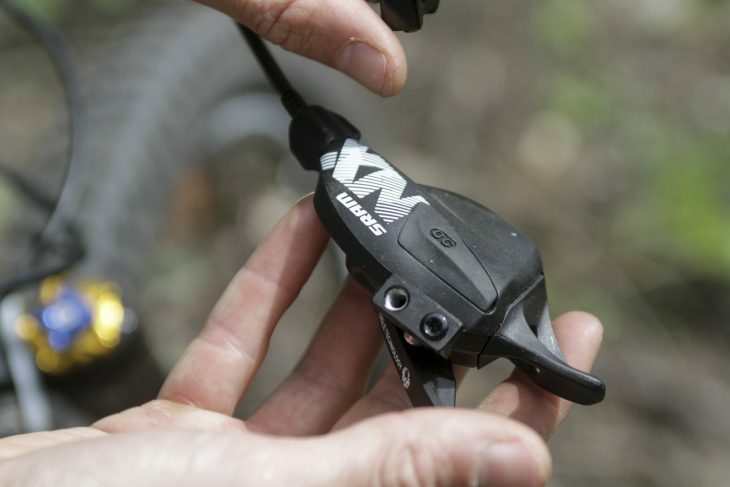 The new NX Eagle shifter is a big step up in quality over the 11-speed version. I can’t say I was a fan of SRAM’s 11-speed NX shifter, with its plasticky shift paddles and fixed clamp leaving a bit to be desired in the ergonomic stakes. Aside from the addition of a 12th click, there has been a significant step up in shift feel and quality with the NX Eagle trigger shifter however, which now closely resembles the GX Eagle unit. 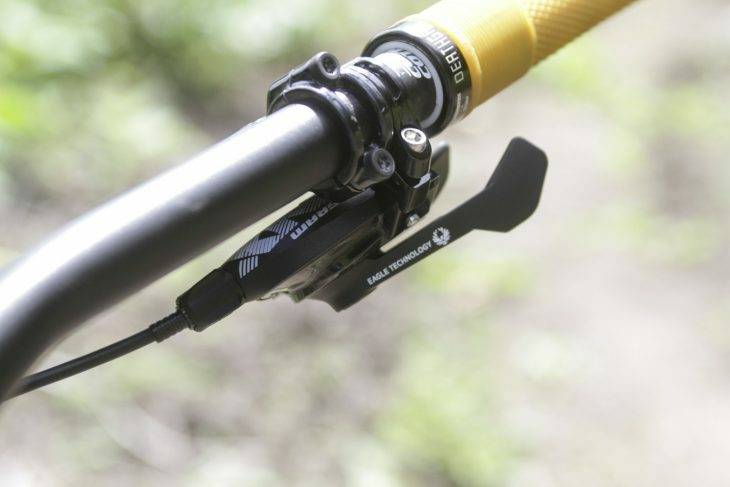 You still get the dual-paddle, thumb-only shift action that is characteristic of SRAM trigger shifters, with a short and punchy single upshift, and the ability to downshift up to five gears at a time. Both paddles are still made from plastic (the GX Eagle shifter gets a forged alloy downshift paddle), but they feel a lot more solid than those found on the 11-speed NX shifter though, and in the real world I had no issues with flex or vagueness. It’s nice and snappy to use. This is the MatchMaker X compatible shifter. A regular version is also available. Changing the cable was super easy. There are two NX Eagle shifters available. The other shift option uses a fixed bar clamp, which is more like the 11-speed NX shifter. The one I’ve been using has a modular bar clamp that allows the shifter to be mounted to a MatchMaker X clamp, so you can integrate it with a SRAM brake. The two-position mount offers up 12mm of lateral adjustability, and it helps the shifter nestle in with more styles of brake lever. One thing I really like with the NX Eagle trigger shifter is the tool-free cable replacement. A small rubber port on the topside of the shifter body flips open, revealing the port for accessing the cable head inside. 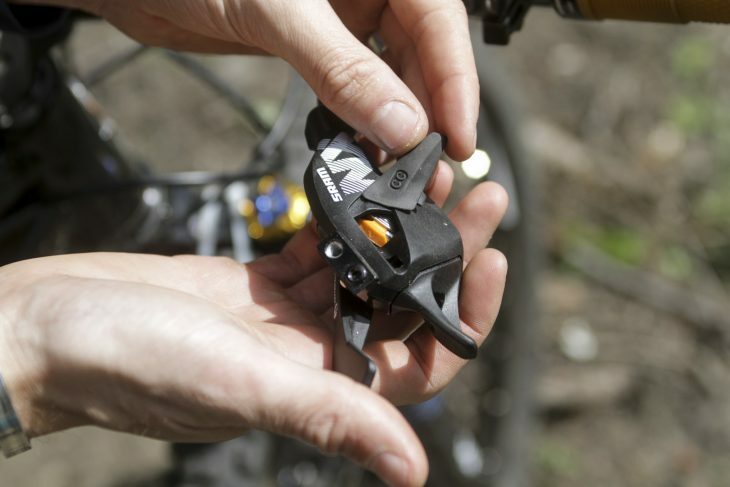 This differs to SRAM’s other trigger shifters, which require you to unbolt and remove the top clamshell in order to access the cable. A small detail, but a nice one nonetheless. 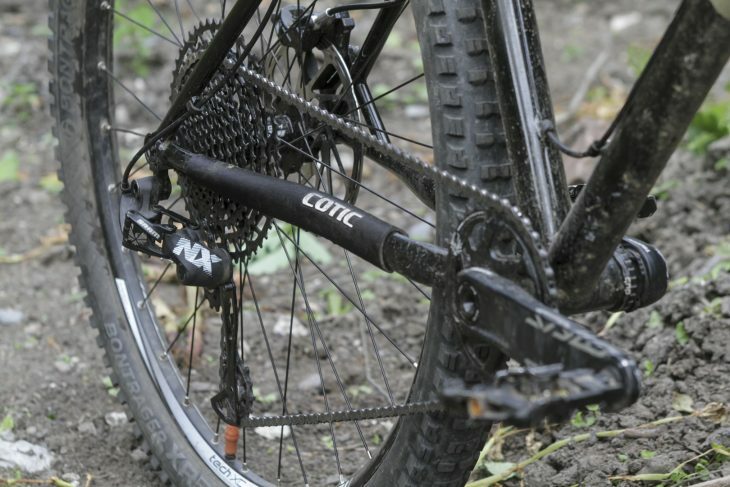 The NX Eagle mech is almost identical to a GX Eagle derailleur. At the other end of the shift cable is the new NX Eagle mech. This also borrows heavily from the GX Eagle derailleur, with the same X-Horizon parallelogram and heavily offset upper pulley that’s designed to clear up to a 50T rear sprocket. The construction is virtually identical, with a steel return spring and chunks of alloy used for the main body, and the Type 3 roller bearing clutch providing additional tension on the chain to reduce bounce. The cage for the jockey wheels is really the only difference – it’s steel rather than alloy. Functionally I couldn’t tell any difference between the NX Eagle and GX Eagle derailleurs, and I wouldn’t really expect to given that there’s only a fiver between their price. Setup is the same as existing SRAM mechs, with the cable entry point being the same, and the limit screws and B-tension being adjusted by a 3mm hex key. As with other Eagle derailleurs, the NX Eagle mech is quite sensitive to setup. 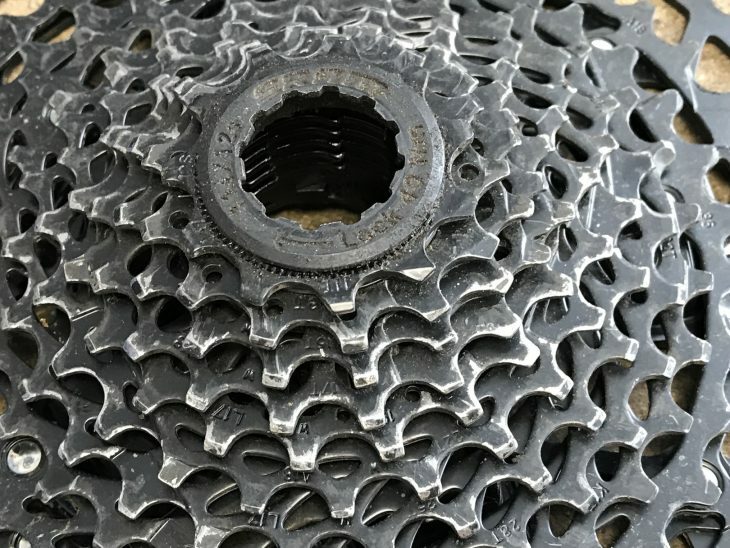 That’s understandable given the tight tolerances required to shift across 12 sprockets with a narrow chain, but it is worth noting that the 1×12 stuff tends to be fussier when it comes to things like B-tension. There’s a lot of metal sticking out from the frame. 3mm steel screws for adjusting the limits and B-tension. The included B-tension tool (a wee red plastic guide) is a useful aid for getting the gap between the upper jockey wheel and the 50t sprocket just-so. 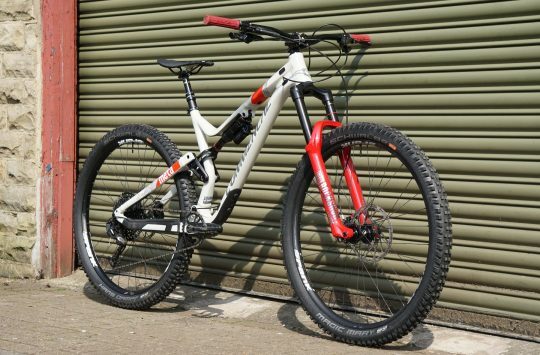 Bear in mind that if you’re running Eagle on a full suspension bike, you’ll want to set B-tension with the suspension at sag. So either get a friend to set it while you’re sitting on the bike, or use a strap to hold the shock at the sag point while you’re working on the B-tension. Set up correctly, the NX Eagle mech has shifted quickly and accurately across each gear without fuss. 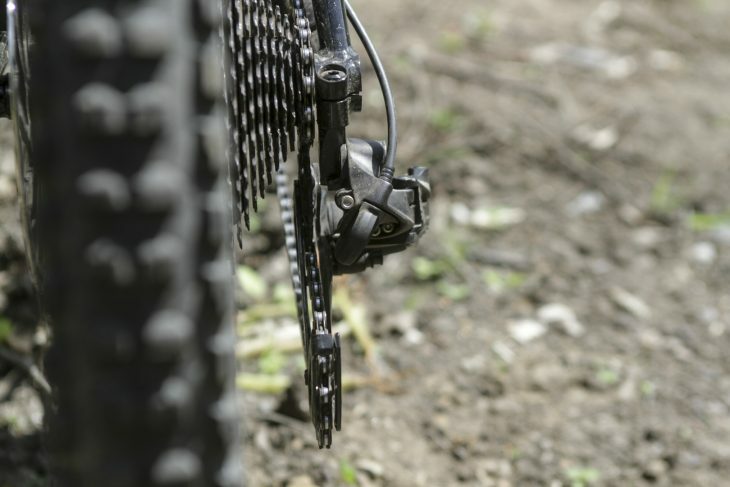 As with all SRAM mechs, it sticks out from the dropout quite a way – especially in the higher gears – which makes it more vulnerable to clipping a rock or a rut if you’re riding through narrow passes. The mech on my test bike has taken a few hits, and has the gouges to prove it, but so far nothing has been fatal. I’m glad to see the Cage Lock function retained, which makes taking the wheel on or off significantly easier by disabling the clutch. 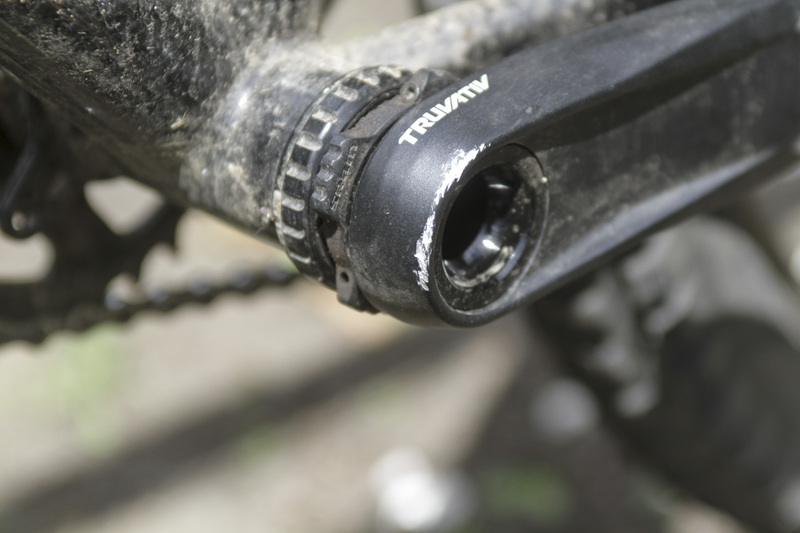 11-50T cassette delivers a huge 454% range without need for a SRAM XD freehub body. The cassette is obviously the biggest point of difference with the NX Eagle groupset, with its cheaper stamped-cog construction allowing it to fit to a standard freehub body. 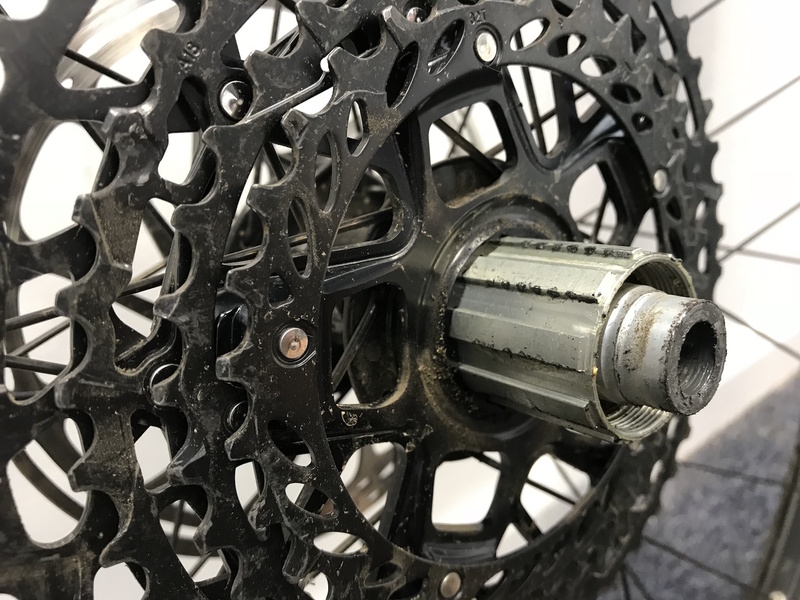 I slid the NX Eagle cassette straight onto a Hope Pro4 hub, where it replaced a Shimano Deore XT 11-46t cassette in the process. In comparison, the 12-speed NX Eagle cassette offers a 454% range, compared to 418% on the 11-46t Shimano cassette. The additional low gearing has been particularly appreciated around our steep valley trails, where climbs can regularly creep into the 25% range at their steepest. Though the black coating is starting to wear on some of the more regularly used cogs, shift quality hasn’t deteriorated, and I’d expect a decent lifespan out of the NX Eagle cassette if prior experience with other SRAM 12-speed units is anything to go by. 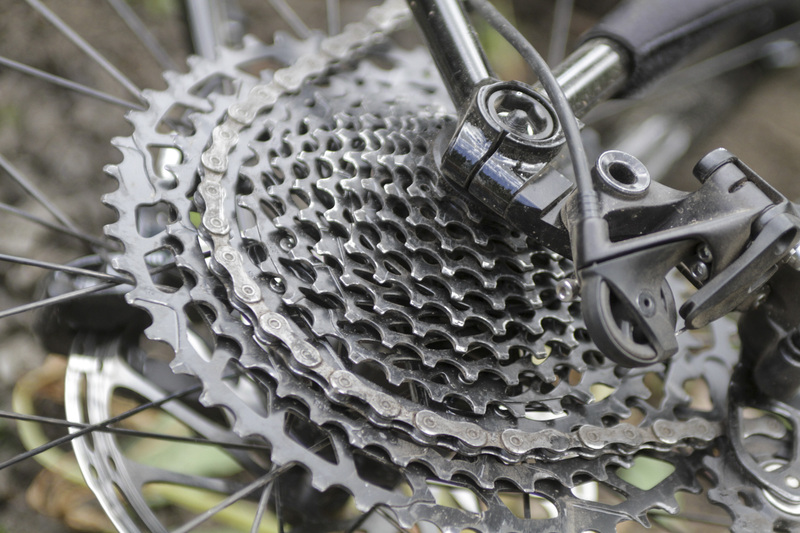 The NX Eagle cassette is designed to slide onto a Shimano HG freehub body. The top four sprockets mount to an alloy spider. The rest are individual cogs though. 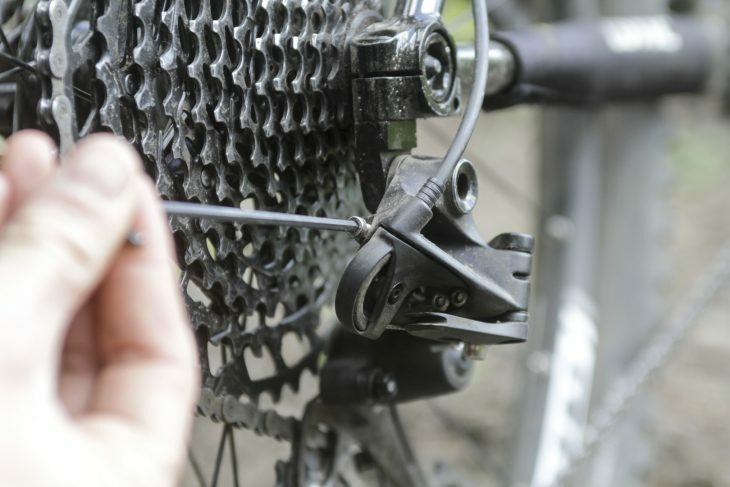 One thing that you will need to watch out for is any chewing that may occur between the cassette splines and lightweight alloy freehub bodies. Though the four largest are made from hardened steel and are pinned together onto an alloy spider, the eight smallest sprockets are all standalone cogs. This means they’re more likely to dig into the freehub splines, particularly if it’s made from alloy – like the one on the Pro4 hub I’ve got, or a DT Swiss 340/240 hub. I haven’t experienced any significant hub-gouging yet, but like any cassette with loose individual sprockets, it’s something to inspect from time to time. Worth noting is that the cheaper construction has also led to a significant increase in weight – we’re talking a whopping 613g, compared to 448g for a GX Eagle cassette. Even the new SunRace MZ90 cassette (which is also 12-speed and 11-50T) comes in 80g lighter at 534g. 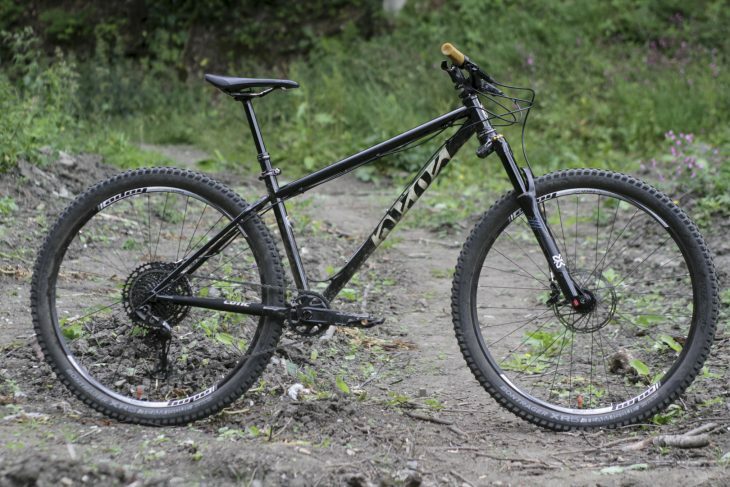 This is admittedly a tradeoff of going to a budget wide-range 1x drivetrain – there’s simply going to be more unsprung mass on the rear wheel, which in theory, could lead to more pinch flats and reduced rear suspension performance (on a full susser, obvs). Did I experience that and could I tell the difference? When changing a tyre on the rear wheel, yes I could – the rear wheel is noticeably heavier in the hand. As to on the trail, no I couldn’t. You’d probably need to do back-to-back testing to notice the extra 165 grams around the rear axle. Nice little Flow Link on the 12-speed NX Eagle chain. There isn’t a whole lot to be said of the NX Eagle chain, other than it’s been worked smoothly and quietly so far. It isn’t finished as well as the GX Eagle chain, which in comparison has nickel plated outer links, black oxide finish on the inner links and chrome hardened pins. The NX Eagle chain has none of that, so is potentially going to be less durable over time and potentially less smooth. I can’t comment on that at this point in time, as we’ll need many more miles on the drivetrain to make any conclusions there. Installation is simple though thanks to the Flow Link connector (make sure you install it the right way round), and so far the stock grease has held up well, with no need for external lubrication despite a couple of hundred km’s on the clock. The Stylo 6K crankset is actually the same as the NX Eagle crankset, just different graphics. You’ll probably notice that the crankset in the middle of our NX Eagle test groupset isn’t actually an NX Eagle crankset. That’s because SRAM didn’t have one available when the rest of the components were sent to us last month, so we’ve made do with a Stylo 6K crankset. The forged 6000-series crank arms are identical , and are available in 165mm, 170mm and 175mm lengths. 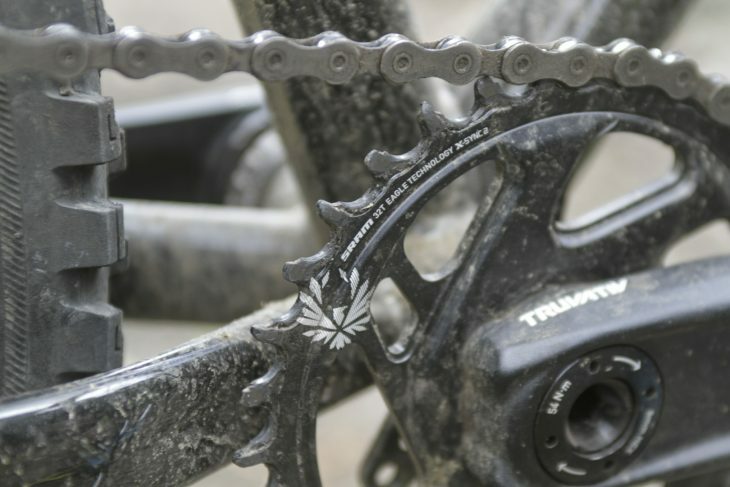 The direct mount chainring is different though – the NX Eagle cranks will come stock with a steel chainring that will offer better durability, while the Stylo 6K cranks come with an alloy chainring that’s a little lighter. Both feature the same X-Sync 2 tooth profile that is currently the market leader when it comes to chain retention, durability and smoothness. On other X-Sync 2 chainrings, we’ve found retention levels to remain consistent throughout the life of the ring, which is a lot more than can be said for other narrow-wide chainrings out there. 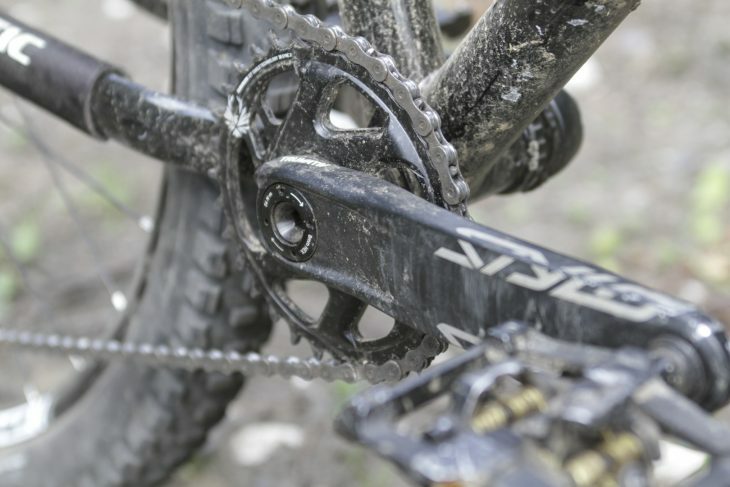 The X-Sync 2 chainring is the leader when it comes to chain retention and durability. New DUB crankset uses a threaded collar for preloading the BB bearings. This has also been my first experience with a new DUB crankset, which features an alloy spindle that measures up at 28.9mm in diameter. So a bit bigger than the steel 24mm spindle used on SRAM’s GXP cranks, and a touch smaller than the 30mm alloy axle used on BB30 cranks. There are a load of reasons behind the DUB design, so you’re best to check out the launch article here for all those details. What I will say is that the DUB threaded bottom bracket feels like a big jump in quality over the old GXP BBs. It’s pleasingly easy to install, and everything clicks together nicely, with generous O-ring seals providing a snug fit into the cups. 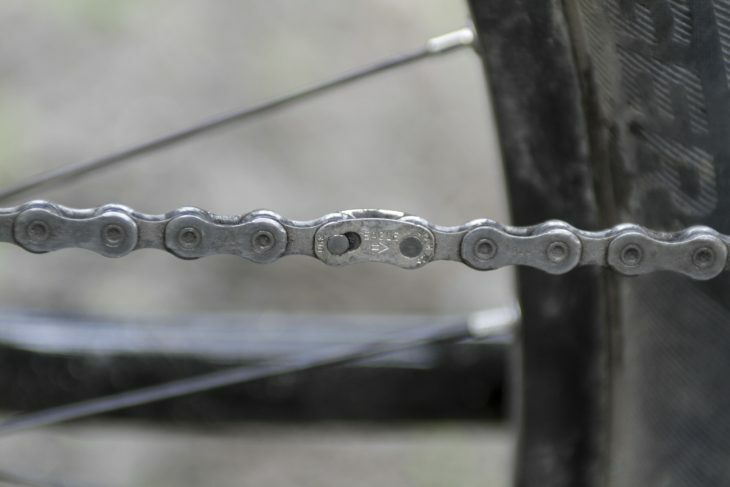 Once the crank spindle has been slid through, a large threaded collar provides straightforward adjustment of bearing preload to take up any movement in the BB. I’ll be reporting back at a later date once we’ve put it through some properly foul weather, but so far the BB hasn’t needed adjusting so far, and it’s all spinning smoothly and creak-free. Take the time to setup the Eagle rear derailleur properly – they can be quite fussy to improper setup. 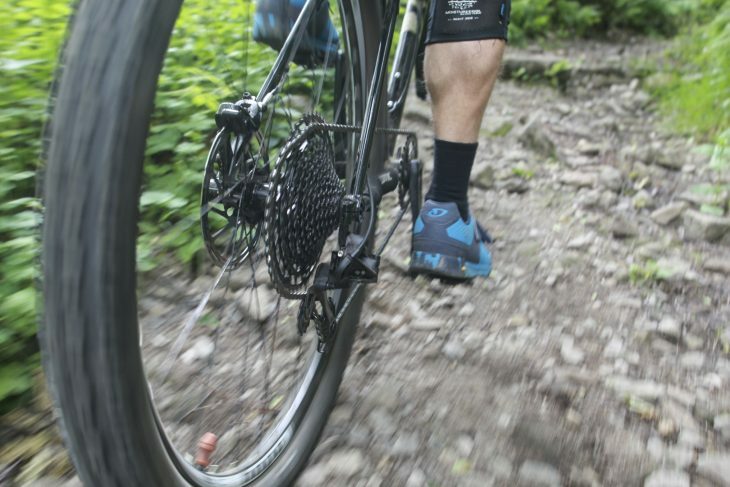 As mentioned above, SRAM’s 1×12 Eagle drivetrains run on a pretty a high tolerance, which means setup is crucial for getting maximum performance. In my experience from riding various Eagle drivetrains over the past two years, I’ve found that 12-speed isn’t quite as foolproof as SRAM’s previous 1×11 systems, so take the time to set things up properly. Aside from being sensitive to B-tension, I’ve also found the rear mech is sensitive to chain length – too long and the shifting feels sluggish and inconsistent. I’ve also seen derailleurs (both XX1 and X01) ripped off test bikes on launches, and I’ve also cracked open an upper jockey wheel myself. While I can’t be sure of the exact root cause in those scenarios (there are too many variables when it isn’t your own personal bike), making sure that the hanger is dead straight, the chain is setup at the recommended correct length, and B-tension is spot-on will go a long way to keeping everything working happily and without issue. For less than the price of a whole XX1 Eagle cassette, the NX Eagle 1×12 groupset is excellent value for money. Early signs from the NX Eagle groupset are very promising. The price is sharp, shift performance is great, and the wide range cassette will offer a useful boost in low-range gearing for anyone who’s currently on a stock 1×11 or 1×10 drivetrain – particularly if you don’t have a rear hub with a SRAM XD freehub body. Though longterm durability is yet to be proven, if SRAM’s existing Eagle groupsets are anything to go by, we don’t have a lot to concern us there. 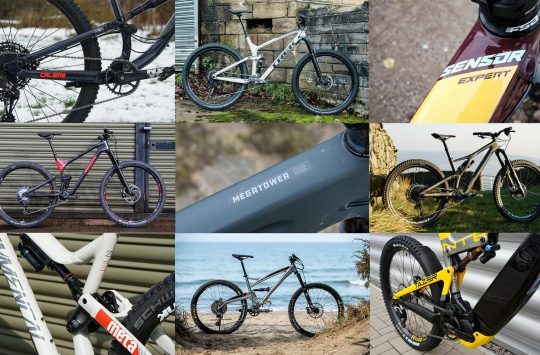 Any idea as to whether a 155mm crank will appear in the new NX line-up?